The rigid construction and variable spindle speed up to 30,000rpm makes it ideal for crowns and bridges in Zirconia, wax and PMMA, from both pin-type and standard blocks. Great results have also been achieved in certain resin nano ceramics, making it a perfect solution for same-day restorations. With automatic tool sensing calibration, 4 axis simultaneous movement and 2 bay tool changer, the DWX-4 will create superb morphological detail from roughing to finishing without manual intervention. As you would expect from Roland DG, the DWX-4 is not just capable, it is very smart. A negative ion generator significantly reduces static from material such as PMMA, making the operation clean and eliminating issues caused by the build-up of waste materials. As with other models in the DWX series, the DWX-4 is an open system, which means you are not restricted to buying your materials or tools from one supplier. And, if you have a preference to drive it from a specific CAM program, the chances are the DWX-4 is fully supported. Roland DG has partnered with Apsom Infotex Limited in India to deliver and support a complete matched digital solution, from scan to sinter. - With dimensions of 13" x 14" x 16" high, the DWX-4 compact dental mill is the ideal milling machine for labs and offices looking to expand operations without losing premium space. The DWX-4 Compact Dental Mill is equipped to mill standard blocks and pin-type materials, including wax, PMMA, zirconia, hybrid ceramic, and resins. Hybrid ceramics and resins, such as VITA ENAMIC® and 3M™ ESPE™ Lava™ Ultimate Restorative, are acclaimed in the industry for their superior strength and aesthetics. They can be finished without firing, which dramatically reduces labor and production time. Highly scalable, the DWX-4 offers multicast capability that allows you to connect up to four Roland machines to one computer, making it easier than ever for dental labs to expand their businesses and increase their production capacity. 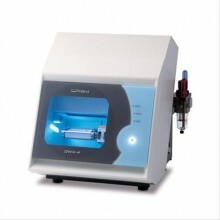 The DWX-4 dental milling machine lets labs control the entire process in-house with a single software seat, maximizing your investment and resources. Open architecture allows the DWX-4 to work with the latest materials and CAD/CAM software so you’re never limited by older technology. If you already have a production solution, the DWX-4 works seamlessly with your existing scanner, oven and compatible CAD/CAM software while eliminating the need to rely on a single source for materials. Compatible with RML-1 and NC code, the DWX-4 interfaces with your computer through a USB 1.1 connector. Unlike traditional CNC mills, Roland has replaced the complex controls with a user-friendly Virtual Machine Panel (VPanel) which operates machine diagnostics and the calibration and milling processes from your computer desktop. The VPanel also tracks overall machine time for maintenance purposes. The DWX-4 is equipped with an integrated air blower that prevents excessive dust buildup and a negative ion generator that reduces static electricity when milling PMMA. Adding to peace of mind, the DWX-4 includes a dust collection sensor that prevents the machine from starting if the vacuum is inadvertently left off. The DWX-4 comes bundled with Roland's open architecture EasyShape CAM software that accepts STL file types. This easy-to-use solution features a user-friendly interface and simple workflow for a short learning curve. With EasyShape, users can choose a range of materials in various sizes. Automatic nesting and placement options help conserve materials. With pre-defined milling strategies, jobs can be sent directly from the software to the mill with no interruption during tool path calculation. Customizable reports can also be generated once restoration cases have been completed. In addition to new strategies for VITA ENAMIC and Lava Ultimate, the latest update of EasyShape includes an expanded tool library, the ability to mill hybrid (glue) abutments, and settings for improved surface finish o quality and reduced milling time for abutments, bridges, copings and crowns. Click the button below to add the Roland DWX-4 Dental Milling Machine to your wish list.